One of the most significant buildings on the Ringstraße of Vienna is the Burgtheather, Austria′s national theatre. It faces the line of the Houses of Parliament, the Rathaus (town hall) and the university main buildings and is surrounded by some of Vienna′s most famous coffee houses. The theatre, colloquially known as the "Burg" ("castle"), is one of the most important theatres of Europe and - after the Comedie-Francaise - considered to be the second-oldest. I always find such superlatives a bit suspicious, but this is what most major guidebooks say, so let′s live with it. It surely is the biggest traditional theatre in Austria. 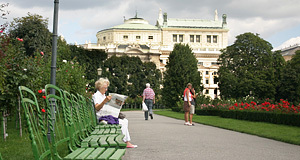 The building of the original Burgtheater was situated in today′s gardens of the Hofburg Palace. It was opened under the reign of Emperor Ferdinand I in 1540 as a ball game hall, which had previously burnt down in 1525. Playing ball games such as real tennis continued until the early 18th century in the theatre. Only in 1741, the Ballhaus or ball game hall was finally transferred from the building and Empress Maria Theresia ordered to transform the hall into a theatre. The "Theater nächst der Burg" ("Theatre by the Castle") was opened in 1748. It could host an impressive 1,200 guests. The Royal Family could access its boxers directly from their private apartments. Today, you can still see the site and parts of the old building on the Michaelerplatz-front of the Hofburg. In the old Burgtheater, works by Christoph Willibald Gluck, Wolfgang Amadeus Mozart, Franz Grillparzer and Ludwig van Beethoven were first performed. In 1776, Maria Theresia′s son Emperor Joseph II (the dude from the movie "Amadeus") proclaimed the Burgtheater to be the "National German Theatre" (despite of the lack of a German nation). He also announced that he wanted all plays to deal with "happy things" and so many tragedies had to be changed in order to be performed in the Burgtheater. "Romeo and Juliet" and "Hamlet" therefore got so-called "Viennese Endings". From 1794, the Burgtheater was called "k.k. Hoftheater nächst der Burg" ("Imperial and Royal Court Theatre by the Castle"). At that point, Vienna had already turned into an internationally important centre of music, drama and other performing arts. The poet August von Kotzebue served as a director. In 1799, performances were changed from Italian or French into German. In 1888, the last performance took place in the old Burgtheater - following 200 year old plans by Johann Bernhard Fischer von Erlach, a Baroque, new wing for the Hofburg was to be built and the theatre moved further up the Ringstraße. Continue with "Burgtheater - Part II"